Can you just not get enough of leading Space Marines against the enemies of the Imperium? Then I have good news for you! The latest in the endless march of Warhammer 40k titles has recently released and I'm here to tell you all about it. 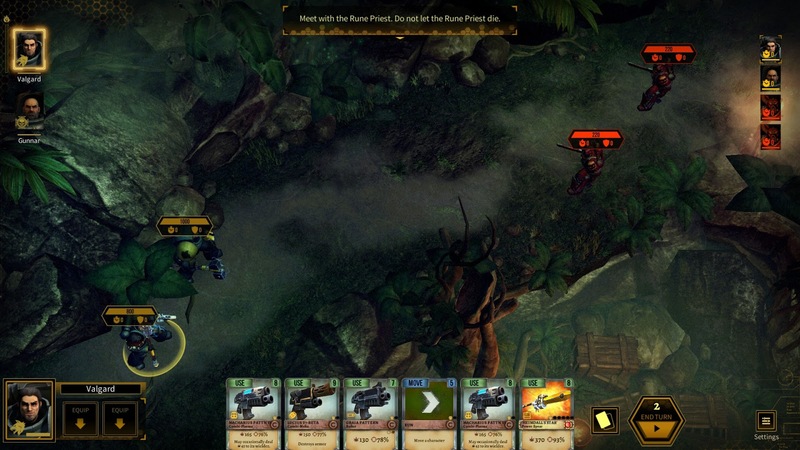 Warhammer 40,000: Space Wolf, developed by HeroCraft, attempts to stand out from the pack by offering up a fresh mish-mash of genres that work surprisingly well together. Basically, this is a turn based tactical game that plays out on a grid, where each unit can take two actions per turn, much like XCOM. The twist is that each character takes actions based on cards in their hand. Most of these cards are weapons that have different attack patterns and damage values, from chain swords and power fists to heavy bolters, rocket launchers, plasma guns, and every other weapon you know and love from 40k. Most weapon cards can optionally be used to move your character. Once played, the card goes back into the deck. There are also other kinds of cards, such as dedicated movement cards which let you cover much more ground, healing cards, special weapons which can be permanently equipped and reloaded, and combo cards which give you some kind of bonus simply by staying in your hand. For the enemy, the cards in hand are usually generic, and based primarily on whether they are ranged or melee fighters. You control your primary character and two fellow Space Marines chosen from a squad of five. Your allies have unique decks based on their class. There's a scout-sniper, a heavy weapons dude, a Terminator, and others. You can tweak their decks to a certain extent, but really their options depend on their class. Your primary character, however, can be fully customized with a 30 card deck chosen from dozens of options. This process feels very much like that of Hearthstone. You can open new booster packs of cards, or spend a currency to randomly generate new cards of a particular power level. Cards come in several tiers, from common to legendary. As you play the game you will unlock more and more cards to toy around with. Gotta' collect 'em all! Now, one might think that you would simply put all the most powerful cards in your deck, but there is a trade off. Turn order in Space Wolf is dynamic. It changes constantly depending on how much "effort" the most recently active character built up with his actions. More powerful cards add a lot of effort to your character, and whoever has the lowest total gets to go next. So if you play two really strong cards in one turn, some of your enemies may actually get to take extra actions before that character goes again. There are, of course, cards that can help lower your effort faster and offset using a big powerful card. I found this system to be one of the better ideas in Space Wolf, as it gives you a good reason to consider whether you should take an action now, or perhaps delay it until later for greater results. The tactical decision making is where the game shines. Positioning matters a great deal, since most weapons have a limited firing arc or distinct shape. Some examples include the sniper rifles, which have a very long range, but the arc is only one square wide, so you must be facing the enemy directly. The big power axes can one-shot KO most enemies, but can hit only the single square in front of the Marine wielding them.Other weapons do less damage, but have much wider arcs. The flamethrowers fire in a cone pattern, so you ideally want to engage a group of enemies from medium range to hit several at once. The battlefields of the game are often somewhat cramped, so you need to think ahead as your Marines move to engage. You don't want to have one standing in a spot that denies another a golden opportunity to do some damage, or even keeping one of your soldiers out of the fight entirely. You will need to press every advantage you can, since your Marines are always outnumbered, and often facing a seemingly endless flow of fresh enemies. If you allow too many foes to close within striking distance of your men, you will start taking damage much faster than the limited healing cards can restore it. 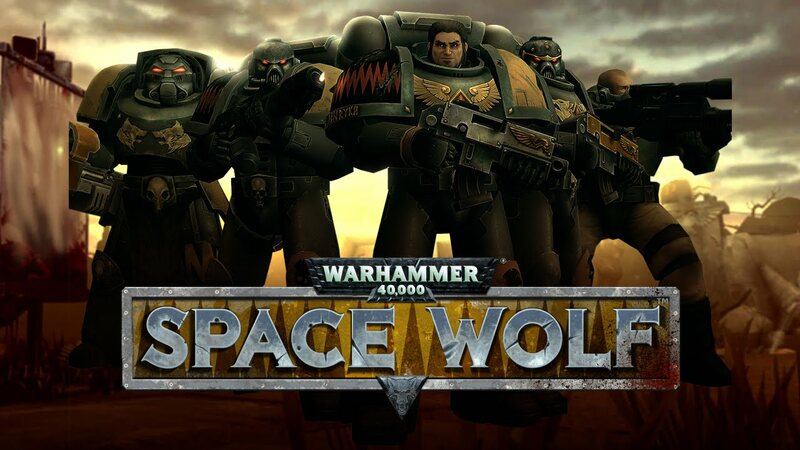 Despite being a game that is also available on iPad and Android devices, Space Wolf manages to look quite respectable on PC. The textures and models are simple, but well done, the Space Marines in particular. The huge variety of weapons all have appropriate attack animations and effects, though some are better than others. 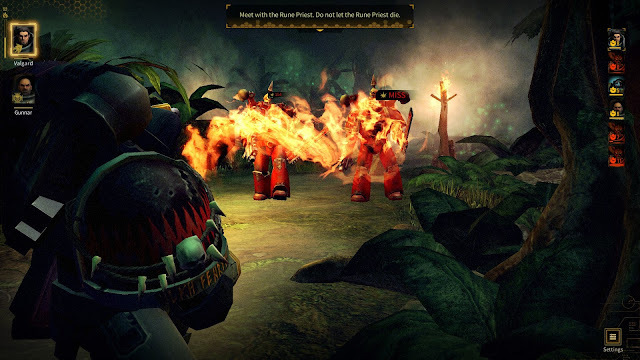 For example, the flamethrower spews out a ton of fire over a large area and looks great doing it, but the poor bolters only spit out a handful of rounds before going silent. It's a bit underwhelming really, but makes sense for game balance. 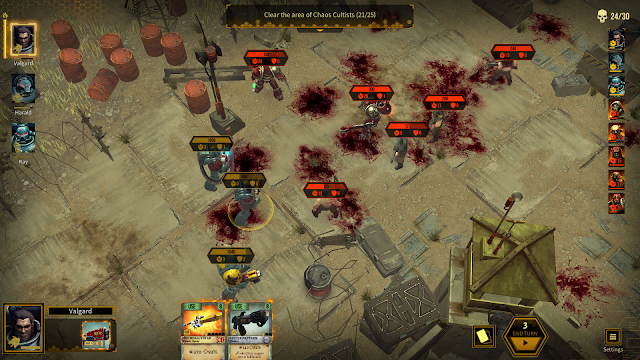 The melee attacks, I am happy to say, all look quite good and result in blood spraying everywhere. This is 40k after all! The area where this game struggles the most is scenario design. While the combat itself is entertaining, and there is a surprising variety of locales to fight through, the objective is pretty much always the same: walk through the level and kill enemies as they spawn in around you. Enemies appear here and there and everywhere, which removes any sense of overall strategy from the game. You have no way of knowing whether a new group is going to appear from a direction that makes sense thematically, or just materialize from the ether right next to your Marines. One mission looked to mix this up, by having you defend a Space Marine priest as he performed some sort of ritual, but then all of the enemies simply came running down a single hallway, two or three at a time. This defied the normal expectation in the worst way, it gave you a new objective, but still took away any strategic decision making. At the end of the day, this is a game focused on tactical combat. Kill the enemy faster than they can damage your men, and you will walk away the victor. In addition to the twenty or so missions of the campaign, there is a survival mode, which you can watch me play here and PvP multiplayer. I tried a couple of times to find an online match, but it seemed no one else was on at the time. Looking at the leader boards, there are at least a few dozen dedicated players out there who have played hundreds of matches online, so I can only assume it works well. Space Wolf is a good value for the price, you get a lot of places and people to fight, and lots of options for customizing your team. Anyone who is addicted to building decks of cards in Hearthstone or similar will love that aspect of the game. 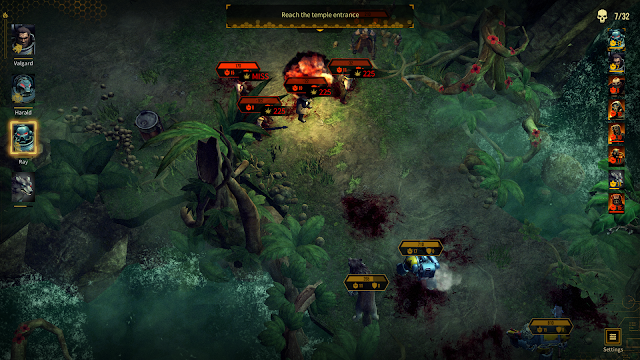 While the combat lacks variety in terms of strategy, it makes up for it with a nice spread of maps and enemy types. There are cultists, corrupted Imperial Guardsmen, Chaos Marines and even more supernatural foes to kill as you progress through the game. The survival mode is almost a game unto itself, since you will need to build a deck focused on long-term sustainability if you want to complete all of the waves. Finally, the online mode is there if you can find an opponent, which is where you would need some real strategy to win. If you are looking for a fresh take on the turn-based tactical genre, and especially if you like purging chaos, give Space Wolf a try. Available on Steam, iOS, and Google Play.